Curtis (Curt) L. Hules, Community Resources Specialist for the Department of Community Resources, Community Resources Specialist / ADA Coordinator, retired on March 29, 2019, after dedicating 20 years of faithful and loyal service to the citizens of Calvert County. Curt was hired on March 15, 1999, and in the intervening years, he has provided reliable and exemplary service; thereby gaining tremendous respect, trust, and admiration from Calvert County citizens and fellow constituents who had the privilege to work with him. While Kurt was busy serving Calvert County, he completed a 20-year career in the United States Air Force Reserve at the rank of Master Sergeant. Curt’s commendable and distinguished service has been demonstrated with a spirit of pride and commitment throughout his career. He developed resource directories and responded to the needs of veterans, food-insecure families, homeless individuals, and people with special needs, securing more than $2.7 million in grants for vulnerable populations. 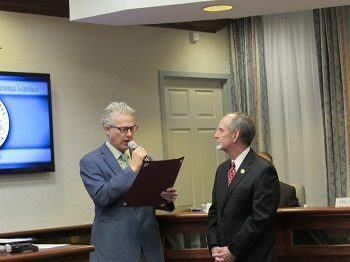 The Calvert Board of County Commissioners presented a proclamation as a tribute to Curt’s outstanding accomplishments during his admirable career; thereby, recognizing this amazing individual who strove to improve the quality of life for all Calvert County citizens. 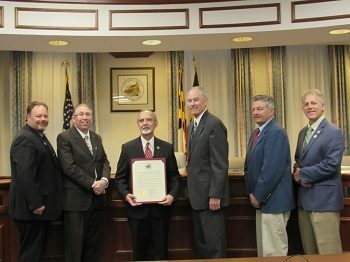 The Calvert Board of County Commissioners at their April 2, 2019 meeting, proclaimed that the appreciation of all Calvert County citizens was hereby extended to Curtis L. Hules on his Retirement after 20 years of public service. The commissioners further proclaimed they joined with the community, Curt’s co-workers, family, and friends in conveying best wishes for a long, healthy, and happy retirement with continued success in all his future endeavors.